If you are a dog lover (as I am!) than you should be aware that the holiday season can bring with it some very unique risks for your 4 legged friend. In all the excitement of this busy season we don’t often think about the health and safety of our dog but there are some things that you should keep in mind during this special time of year. Few things can spoil the holidays more than an unexpected visit to the veterinary emergency clinic. Keep in mind that some table scraps are not healthy for your dog and may even cause physical injury. A good example is chicken or turkey bones. While dogs loves them they can actually splinter and cause internal injuries that could even be lethal to your pet. Rich and fatty foods can actually be toxic to a dog. Beef bones, however are OK as a treat. Also on the list of foods that you should not give your dog are onions and garlic (which can cause anemia), grapes and raisins and yes, even chocolate. It should go without saying that any alcoholic beverage is dangerous to your dog as well as foods that are high in sodium or sugar or contain a large amount of fat. For a more complete list of dangerous foods you can go here. There are many foods that are completely safe to give your dog such as cooked chicken or turkey (no bones) and surprisingly apples and raw carrots. When feeding your dog human foods moderation is always the key. Even though our dog is a part of our family we must remember that he/she is not human and has very different dietary requirements than we do. Also remember that dogs are curious and may decide to chew on or even digest new things such as bows or wrapping paper or the extension cords you are using to light up the tree. It’s also important to note that if you have a live tree in your home that drinking the water can make your dog sick as well. While dogs may seem to enjoy visitors the real truth is that too many people around can cause the dog to feel “stressed”. 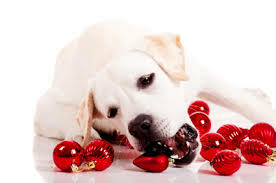 You might consider placing your pet into a quieter environment during holiday parties and get togethers. Our family pets can enjoy the holidays just as much as we can and we owe it to them to make sure that they are safe and happy too! If you do suspect that something is wrong with your pet you can check it out here and be sure to keep your vet’s number handy just in case.